A blog fueled by enthusiasm about Saab, the greatest car company between the North and the South Pole. And their cars, which probably is the only cars that would start on a cold and crispy South Pole morning. IMPORTANT NEWS: National Electric Vehicle Sweden has agreed to buy the assets of Saab Automobile and the sale is expected to be finalized during the summer. EDITOR WES RAYNAL: The car is roomy and tight, the turbocharged six-cylinder has more than enough power and the ride is smooth. INTERACTIVE ASSOCIATE EDITOR JAKE LINGEMAN: The Harmon-Kardon stereo system booms and the iPod input worked great. DIGITAL EDITOR ANDREW STOY: Saab seats are, hands down, the best in the business. EXECUTIVE EDITOR--AUTOWEEK.COM BOB GRITZINGER: I find the car's styling is attractive in a classic sense. I suspect it will still look good once the last payment is made. 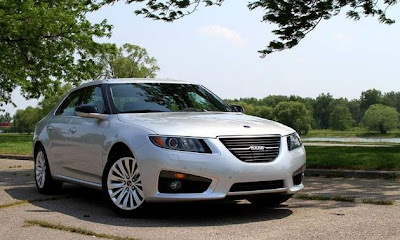 MOTORSPORTS EDITOR MAC MORRISON: The ride is comfortable, the handling not watered down to benign characteristics and quite surefooted, and I found the steering gave me enough feel and feedback to guide the Saab along smoothly and quickly with little effort. EXECUTIVE EDITOR ROGER HART: This is the best Saab I've driven. What will happen to "new Saab"? Who would you like to see as new owner of Saab? Want to contribute news, reviews, articles, information, etc? Saab Automobile is being aquired by National Electric Vehicle Sweden. What will be your next car? All text written on this blog is the property of the author, unless otherwise specified. Travel theme. Powered by Blogger.